Greenhouse gas emissions, particularly methane and nitrous oxide, in agriculture were reduced by 15.6% in the period 1986–2014. This reduction is mainly the result of lower volume of cattle, pigs and poultry as well as improved methods of handling livestock manure. 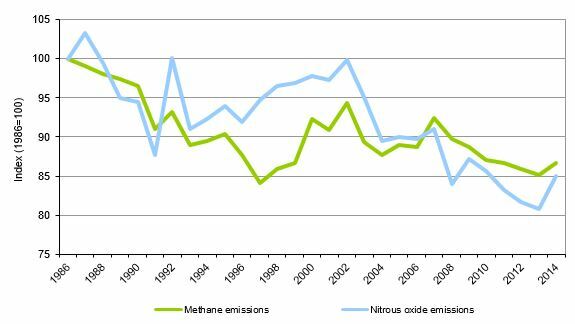 This indicator shows emission trends of the greenhouse gases methane (CH4) and nitrogen oxide (N2O) from agriculture in the period 1986–2007. There is growing evidence that methane and nitrous oxide, like other greenhouse gases, increase the air temperature, thus causing global climate change. The latter affects the natural environment and causes enormous damage to the economy, especially agriculture. The data is shown with reference to the base year, 1986, used for calculating Slovenia's commitments to reduce emissions. Emissions were estimated according to the methods of the IPCC (Intergovernmental Panel on Climate Change), taking into account local peculiarities in farming practices. Methane and nitrous oxide are the only greenhouse gases monitored in relation to emissions caused by agriculture. As each of them has a different greenhouse effect, they are recalculated into carbon dioxide equivalents. The greenhouse gas effect of methane is 21 times, and nitrous oxide 310 times stronger than carbon dioxide. Carbon dioxide resulting from the use of fossil fuels in agriculture is not monitored by the IPCC method in the agricultural context. It is, therefore, not taken into account within this indicator. Slovenian Environment Agency 2016; European Environment Agency, 2016. Not to exceed an increase in greenhouse gas emissions from sources excluded from the EU-ETS by more than 4% by 2020 compared to 2005. The goals are presented in more detail under the indicator Greenhouse gas emissions. Greenhouse gas emissions from agriculture can be classified as direct (e.g. 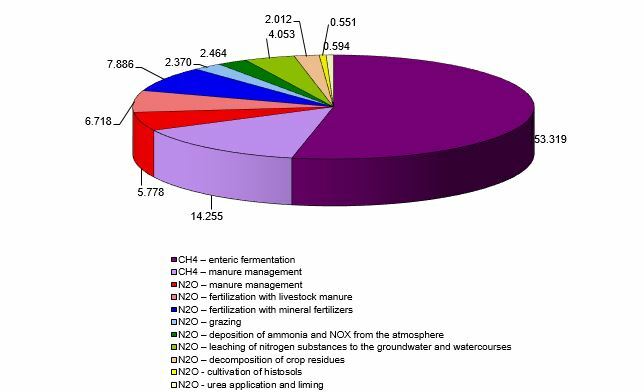 formation of methane during fermentation that takes place in the digestive system of livestock, methane emissions from the storage of livestock manure, nitrous oxide emissions from the storage of livestock manure, fertilisation with livestock manure and mineral fertilisers, grazing, biological fixation of nitrogen, decomposition of crop residues and the cultivation of histosols) and indirect (e.g. as a result of ammonia and NOx deposition from the atmosphere or leaching of nitrogen substances into groundwater and rivers). Methane is produced during fermentation of fodder in the gastrointestinal tract of domestic animals and during the storage of livestock manure. Due to a relatively large number of animals and the specificity of their digestion, cattle breeding accounts for around 80% of methane emissions in Slovenia. The majority of nitrous oxide is formed during the storage of livestock manure and fertilising with livestock and mineral fertilisers. A large amount of nitrous oxide is also released from indirect emissions as a result of leaching of nitrogen substances into groundwater and rivers. In accordance with the revised IPCC methodology, CO2 emissions are now included in emissions from agriculture. In Slovenia, there are two minor sources of these emissions – fertilising with urea and liming of soil. They contributed less than 1% to total emissions in 2014. In the period 1986–2014, annual methane emissions from agriculture were reduced from 52,968 to 45,923 tonnes (13.3%), while nitrous oxide emissions were reduced from 2,135 to 1,815 tonnes (15%). The greenhouse effects of both gases, expressed in CO2 equivalent, were reduced from 1,960,430 to 1,688,895 tonnes, or 13.9%, in this period. In meeting Kyoto Protocol goals in agriculture, we are slightly below the EU average. In absolute terms, cattle breeding contributed most to the reduction in greenhouse gas emissions. Here, methane emissions from fermentation in the digestive system of livestock and nitrous oxide emissions from the storage of livestock manure were reduced considerably. The reduction can largely be contributed to improved breeding efficiency, as similar production is achieved with a considerably smaller livestock population than in the past. Emissions from poultry and pig breeding were greatly reduced as well, which is largely a consequence of the reduced extent of breeding. Reduced greenhouse emissions are also a consequence of improved systems of animal manure management. After the introduction of more efficient slurry separation and installation of anaerobic digesters for biogas production, methane emissions per animal in the storage of pig manure were reduced by approximately 20%. Greenhouse gas emissions increased in free range cattle breeding and the breeding of small ruminants. An increase in free range is not problematic, as emissions from cowsheds and manure storage tanks are reduced in the free range system. A favourable effect of reduced emissions from cattle breeding was partly offset by increased emissions from the breeding of small ruminants. Slovenian legislation does not specifically address greenhouse gas emissions from agriculture. Exceptions are large pig and poultry farms, which, under the IPPC Directive, have to operate according to the principle of the "best available techniques". Indirectly, the atmosphere is protected by some regulations intended to protect water and soil, especially the Decree on the protection of waters against pollution caused by nitrates from agricultural sources. Indirectly, reduced emissions of nitrous oxide are also attributed to the agri-environmental measures launched in 2001 under the Slovenian Agri-Environment Programme. In 2004, they were included in the Rural Development Programme 2004-2006, and are also included in the Rural Development Programme for the periods 2007–2013 and 2014–2020. Indirectly, specialist tasks in the field of animal husbandry financed by the Ministry of Agriculture, Forestry and Food also contributed to lower emissions. Author(s): Jože Verbič, Agriculture Institute of the Republic of Slovenia, Tajda Mekinda Majaron, Slovenian Environment Agency.